TO THE NEW ADVENTURES OF TARZAN! Tarzan leaves his Afican Jungle and heads to the Guatamalan Jungle to search for his friend, D'Arnot who has crashed in the jungle. On his way, he meets Major Martling and Ula Vale who are on an expedition to the Lost City to look for the Green Goddess which is a Totem that is worshipped by the Natives and contains a fortune of jewels and an ancient formula for a Super-Explosive. 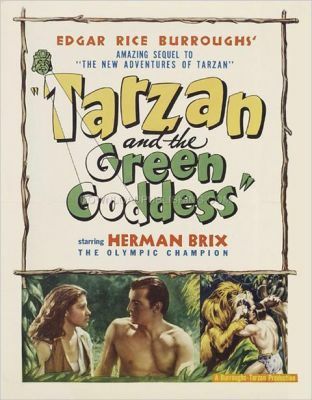 Now that the Green Goddess is in their possession, the Tarzan expedition starts on its long and arduous journey home. Production Company: Burroughs-Tarzan Enterprises Inc.